This is the year that counts! The coming months will determine the future of health care in America. In the Congress, in the courts, and at the ballot boxes, what happens this year will determine the future of freedom in our health sector — and our country. Former Attorney General Ed Meese said recently that the coming Supreme Court decision on ObamaCare is “the most important in 100 years.” How right he is! Either we will turn our health sector into a centralized system controlled by elite policymakers. Or we will get to work fixing the very real problems in our health sector with policies that put doctors back in charge of medical decisions and empower patients to be active partners in managing their health care and health spending. The court’s decision could range from letting the whole law stand to throwing it all out. The more likely, but still optimistic, scenario is that the Supreme Court will declare part of the law unconstitutional, leaving parts of it still standing. If that happens, the November elections will be crucial so that the voters will have the final say. Whatever the outcome, Congress will be faced with major policy decisions. Legislators across the country must be ready for the next phase in the battle. We will be working with all of them with a goal of helping to develop and implement workable, market-based solutions that empower patients! Our side, for once, has an advantage. The American people are on our side, as public opinion polls showed before, during, and after ObamaCare was enacted. The information in our book, Why ObamaCare Is Wrong for America, provides a one-stop guide to the health overhaul law. It explains the law, its massive flaws, and its destructive impact. And it points the way toward reforms that will expand access, control costs, and preserve patient choice and innovation in health care. You need this book! The Galen Institute has not stopped fighting this law for one minute since it was enacted. And we will not stop now. 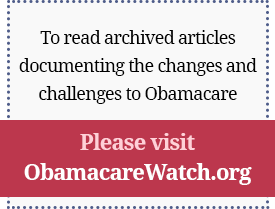 We are focusing our educational efforts on highlighting the damage of ObamaCare and on sensible alternatives, bringing our analysis to millions of readers and viewers. This is the battle for liberty of our time. And we need your help. Please consider a tax-deductible contribution to support our work. This is the year that counts! Thank you! Galen’s new website! We are always working to make sure our communication tools are state-of-the-art, and our web presence is crucial. Our terrific team at the Galen Institute — led by Tara and Jena Persico — managed the development of a new website that we just launched yesterday which provides powerful new capabilities, including videos, blogs, RSS feeds, social media links, and all of the quality research you expect from us. It’s robust, easy to navigate, and jam-packed with the information and resources you need to join us in these vitally important battles. Please visit us at www.galen.org and see what we mean. In this CNN video, Mitt Romney says he’d repeal President Obama’s health care plan, but critics say it’s modeled after his own plan. Health and Human Services Secretary Kathleen Sebelius hopes you will believe her and not your own eyes, as she pens an op-ed in The Washington Post deceptively entitled, “The Affordable Care Act, helping Americans curb health-care costs.” Costs already are rising faster than they did before the law was enacted in 2010. A Kaiser Family Foundation survey found that premiums for a family policy topped $15,000 a year in 2011, increasing an average of $1,300 in the last year — three times faster than the year before. A number of factors contribute to rising health-care costs, but the mandates, taxes, and regulations in the health-care law are accelerating the trend. Health insurance is consuming a bigger share of employer budgets, preempting pay raises and pushing higher costs onto employees. The American people know their health costs are rising, despite Secretary Sebelius’s claims to the contrary, and Obamacare is making it worse. Former Massachusetts Gov. Mitt Romney’s attempt to distance himself from the despised health care law isn’t working. There is a way out, however: Romney needs to take a bolder step and say that the law he passed in Massachusetts never would work for our diverse and complex country, that he shouldn’t have tried to do so much all at once, and that he should have put health costs, not universal coverage, at the top of his priority list. He needs to emphasize as strongly as he can that a federal mandate to purchase health insurance is unconstitutional and that he wants to sign a bill fully repealing Obamacare. And he needs to explain what really happened in the passage of Romneycare. Unless he takes steps to remedy his position, he will have trouble convincing Republican voters he is serious about repeal and will have an even harder time mapping a clear plan on health reform should he be elected president. Please RSVP directly to the Federalist Society at ctfedsoc@gmail.com.